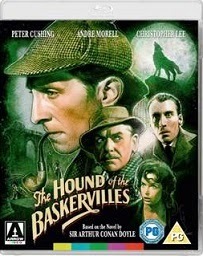 Sherlock Holmes is the most filmed character of all time but it is arguably this 1959 re-telling of Sir Arthur Conan Doyle s classic tale The Hound of the Baskervilles, from legendary horror studio Hammer and starring genre stalwarts Peter Cushing and Christopher Lee, which stands as the super sleuth s finest cinematic hour. Rising up out of the swirling mists of Dartmoor, Baskerville Hall stands tall and gloomy. Its occupant, Charles Baskerville, has been found dead in mysterious circumstances. Could Sir Charles have been the victim of the so-called Baskerville Curse , which tells of a deadly beast that stalks the surrounding countryside? Unperturbed by the legend, next-in-line Sir Henry Baskerville (a rare leading man performance from Lee) sets out to Dartmoor to assume inheritance of the family estate, under the auspices of the famous detective Sherlock Holmes and right-hand man Dr. Watson (Andre Morell). Imbued with an atmosphere as thick as fog, The Hound of the Baskervilles is a superlative gothic yarn which benefits from game performances from Cushing, Lee and Morell, as well as the expert direction of Terence Fisher, known for helming many of Hammer s most celebrated efforts including The Curse of Frankenstein, Dracula and The Devil Rides Out.